If all you need is love, you'll find it in abundance at El Balcon. But then if you also need great food, refreshing drinks, aircon, free wi-fi, fun decor and a perfect perch to people-watch.. you've definitely come to the right place. 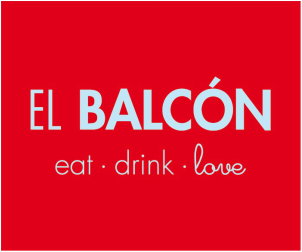 El Balcon is the love-child of the big hearted Falah family.. who hail from the Colombian coastal city of Baranquilla. Together the three siblings, Abdul, Mimi and Maizza have injected this small space with the energy and hospitality that costeños are known for, building upon the balcony's prime location, to create one of the most recommended places in Cartagena. A quick click on the ubiquitous tripadvisor site will reveal hundreds of glowing reviews.. enamored with the food, the service, the drinks, the ambience. The thing that impresses most? In a city that boasts so many top-notch restaurants and bars, a great majority of El Balcon's overseas visitors, come back for multiple visits over the duration of their stay. That says something, right? Ofcourse the menu is very good. The family team listen to their customers and deliver exactly what travellers want. Market-fresh seafood like lobster, seafood caserole, shrimps and salmon; traditional Colombian food favourites like ceviche and the Posta Cartagenera (tender slow-cooked meat in a sweet dark sauce and accompanied with coconut rice) and international winners done well such as nachos, wraps and a thai green curry. And oh! The drinks! Settle back and tick Cartagena's must-trys off your list: limonada de coco, lulo, maracuya. Booze-free they're super good.. or spike them with some Colombian rum and you're really in business. The specialty Balconazo cocktail is a silent, but deadly assassin. It combines rum, gin and aguardiente (the specialist liquors of Cartagena) with the punchy tang of passionfruit juice to create a drink that goes down smooth but one you definitely feel when it's time to stand up! El Balcon have this one on permanent special.. 3 for the price of 2. Dangerously in love? You might want all 3 to yourself if you're sitting on the balcony.. it's difficult to tear yourself away from the ever-entertaining roll of happenings beneath you in Plaza San Diego; fine-arts students hanging out or busking, high-society jostling for tables at Juan del Mar, the setting for two of Gabriel Garcia Marquez's famous novels (Love and Other Demons, Love in the time of Cholera) or maybe me, pulling up on my orange bicycle to come quench my thirst.